What is Touch Based Human Machine Interface (HMI) Market? Touch based human interface (HMI) is the simple, easy and natural interaction with the human machines. The application of human machine interface is increasing day by day in different industries. By using different technologies the human interaction with the machines will become easier and can be more visual and friendly. Touch based HMI is segmented based on the different technologies like resistive, capacitive, surface acoustic wave and ultrasonic. Capacitive touch screen technology is the most widely used technology. The capacitive touch screens are reliable and enhance the visibility of the displayed data by emitting large wavelength of light from the screen. What are the major applications for Touch Based Human Machine Interface (HMI) Market? The major applications of touch based human machine interface includes consumer, public and industrial sectors, medical, aviation, military and transportation. In automotive the touch based HMI is applied to control the temperature in vehicle and also for navigation purpose. Touch based interface is increasing its application in consumer applications such as interactive table tops, mirrors. We can reorganize and resize table tops developed by touch based interface tech with a swipe of finger; which is generally used to display a digital collage of a family photos. It is also increasing its applications in kitchen counters and refrigerator doors which is allowing the users to view their favorite recipes, navigate and interact with the instructions and ingredient information via touch, scribble and save notes which can be directly shared with the other person. The use of holographic technology is increasing. The application of this technology in shopping complex could change the purchasing style of the customers. By using this technology customers can view the displayed item and initiate a series of hand gestures to access all the relevant information about the item. Many research and developments are observed in touch based human interface. One such development in smart house is a cheap paint technique which allows the human to turn off the light, raise the temperature by sliding the hand up by tapping the hand anywhere on the wall. 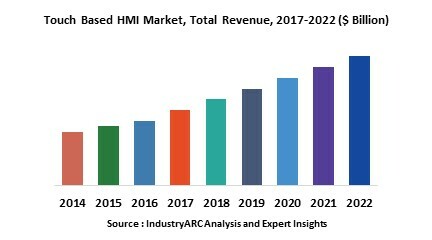 Who are the Major Players in Touch Based Human Machine Interface (HMI) Market? The companies referred in the market research report includes Siemens AG, Schneider Electric SE, General Electric, ABB Ltd, Fuji Electronics Co., Ltd., Mitsubishi Electric Corporation, Omron Corporation and more than 10 other companies.